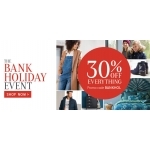 The La Redoute Promotion is on with 30% off everything of clothes, shoes, accessories. Shop online with promo code: "BANKHOL". Free UK delivery. The promotion is valid online untill 29 August 2016.